Peer5 integrates with iOS and tvOS apps in a straightforward and simple way. Peer5 installs a proxy between your video player and your stream which intercepts network requests and proxies them through a P2P mesh network. Peer5 supports hybrid applications. Peer5 has a plugin integration for Cordova/Ionic as well as solutions for other hybrid application frameworks. The native app SDK is also tested with hybrid applications. Integrating with a hybrid app is simple and easy. Delivery of content via P2P will work on all Apple devices running iOS 11.0 and up and tvOS 11.0 and up (versions with WebRTC support). 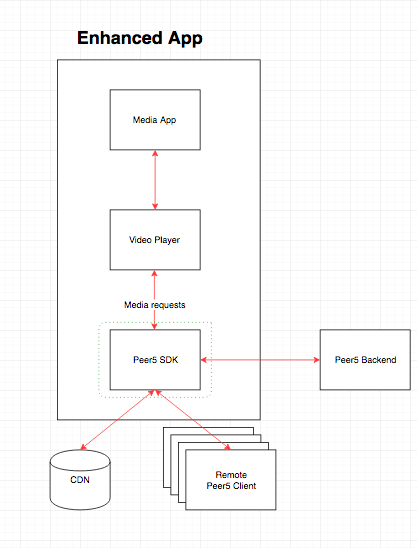 Peer5's SDK falls back on native video delivery on older versions of iOS and tvOS as well. If you're using an HTML5 player, please follow the hybrid app instructions. For native playback, please follow the native application instructions below. Player requests for video segments (.ts files) are intercepted and load balanced between HTTP and P2P. That’s it. Peer5 should now be integrated into your app. You can confirm that it’s working by going to your Peer5 dashboard and filtering traffic by platform, either "iOS" or "tvOS". Note that the SDK instance should be bound to the application’s lifetime. Requests from the Peer5 iOS SDK to the CDN will originate from the ios.peer5.com or tvos.peer5.com domain, depending on your integration. If you have referrer block configured in the CDN, please also whitelist the ios.peer5.com & tvos.peer5.com domains so requests will be able to bypass that authentication. A: Log into your Peer5 account at https://app.peer5.com/login, then go to the Realtime Analytics tab and click on the "Add a filter+” link in the top-left corner of the page. Select "Platform Name” as your filter and choose either "iOS” or "tvOS”, depending on your integration. After a correct integration you should see traffic there. Traffic may take several minutes to start appearing in the dashboard. Q: Who do i contact regarding integration questions? A: Use your direct communication channel with Peer5. If you are not sure who your direct contact is, please contact us at support@peer5.com. A: You can change the percentage of users who have peer-to-peer delivery enabled from your Peer5 dashboard at https://app.peer5.com/deployment. Note that this change can be made even after you have deployed your app. Q: How do I change the way Peer5 runs in cellular networks? A: Peer5’s iOS SDK is battle tested in real world applications and contains an extensive test suite that runs on each version. Integrating the SDK should have no performance impact on your application. Users, on the other hand, will enjoy higher quality streaming with the SDK. Q: Which iOS versions do you support? A: For iOS: iOS 9+ is supported. P2P sharing works on iOS 11+. For tvOS: tvOS 9+ is supported. P2P sharing works on tvOS 11+. If you require support for lower versions, please contact us (support@peer5.com). A: Yes, tvOS is supported! You can the Peer5 SDK for tvOS just like you use it for iOS. A: The code integration typically takes less than an hour. Q: Why do I get an error for incompatible architectures? A: Peer5 ships a "fat framework" with Peer5Kit.framework containing both x86 and ARM builds so you can test the code both on a real device or an emulator. When installing the SDK with CocoaPods it takes care of the architecture differences automatically when submitting to the app store. Some customers have reported that uninstalling and reinstalling the pods before creating the archive solved this issue for them. Q: I have more questions, where can I get more information? A: Please refer to https://www.peer5.com/faq for additional information.